In 1095, Byzantium was an empire under threat. From his seat in Constantinople, Emperor Alexius saw his territories across the Bosphorus in Anatolia coming under intense pressure from the Seljuk Turks, a Muslim people originating in central Asia who were steadily overrunning provinces that has been in the empire since Roman times. The Seljuks were not intruders to be taken lightly, and had succeeded not just in taking control of many Byzantine towns, but had also met the cream of the imperial army in combat and cut it to shreds. Faced with potentially catastrophic losses of land and power, he issued a plea for help to the Christians of the West to supply soldiers to come to his aid. Alexius asked for a military intervention to help protect his lands from invaders, but the papal conference in Piacenza which received his request interpreted it rather differently – as a call to launch a crusade to the Holy Lands, taking back Jerusalem and other holy places from the Muslims who had held them for some 450 years. It was a misunderstanding which was to have momentous consequences for both Europe and the Middle East. The first public call to Crusade was issued in the town of Clermont on 27th November 1095 – although the word “crusade” was actually never mentioned during this speech, instead being a term that later generations came to use retrospectively. The call soon spread across Europe, gathering both ordinary people and nobles alike into large groups that chose to make the journey across Europe and Byzantium, then through the Middle East towards Jerusalem itself. They assembled in droves, driven by some sort of herd instinct as a chain reaction spread across the continent: where one man chose to go on the great journey, it encouraged his neighbours to do likewise. Ultimately, four major armies were assembled; one in southern Italy, two in France and one German-speaking group in the north. This northern army is especially significant, as at its head was Duke Godfrey, one of the most well-connected nobles from the Kingdom of the Franks. Godfrey, whilst one of many aristocratic men riding to join the Pope’s call to arms, rose in stature through his exploits along the way to become revered as “the perfect knight” and later elevated to become the first Christian King of Jerusalem, making him stand out amongst the thousands who travelled as an exceptional individual. But it was not just knights and soldiers who followed Godfrey, but a straggling train of civilians all making their own pilgrimage (which became known as the “peasants’ crusade”). Untold numbers died along the three year journey it took them to reach Jerusalem from Northern Europe, and so gruelling and painful was the experience, that although many other crusades would later depart from Europe over the next 300 years, not one of them succeeded in following the exact same path as those who left in 1096. This made the First Crusade a unique feat of endurance for those who undertook it. Undertaken over the summers of 1987 and 1988, the complexity of such an undertaking was mind boggling. Not only did Severin need to journey around 2500 miles by land on horseback, he aimed to do so a horse that was as close to those used by the knightly Crusaders as possible (he chose an Ardennes Heavy Horse as a replica charger with a much smaller Irish mount as palfrey). Then there were the language barriers, the visa and paperwork issues of travelling through a Europe very different to the one we know today, and the difficulties in finding shelter, food, farriers and veterinary aid along the way on a day-by-day basis. Oh, and there was one other thing. To follow the route Godfrey and his followers took would mean divining the course of a network of old Roman roads, using maps that indicated where the roads were, but did not necessarily have modern settlements marked by their current names. The resulting book makes for interesting reading, covering mainly the experiences of Severin but also interspersing sections about the First Crusade at appropriate intervals. 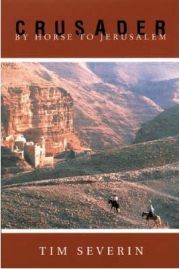 As a travelogue it fascinated me not only to discover what undertaking such a journey on horseback might entail, but also to realise just how much Europe has changed since he did so. Severin has a wonderful way with words, to describe what must have been a very monotonous trip at times in words that draw the reader in and make you want to read what happens next. In terms of historical value, the outcome is perhaps less dramatic, though. I was impressed to learn just how much of the Roman network of roads and road markers survive despite modern motorway construction, for example, but less impressed to discover the reason why medieval knights used palfreys rather than ride their war horses (riding large, lumbering beasts for a long time makes you saddle sore, amazingly enough). Severin also had a support jeep (which he drove himself as well as riding the horses in a one-man relay, so perhaps not the level of Grylls-style cheating this may imply), the benefit of being able to afford food at all times (unlike the starving peasants on the crusade), and of course only approached hostile territory when skirting around Lebanon near the end of his journey. So, as a piece of experimental archaeology you were never going to learn a great deal from this journey, but as a way for the reader to learn a bit of medieval history, it was really rather enjoyable. There were a few points that detract from this book, however. Firstly is the poor copy-editing; typos are not only repeated throughout the text (there is actually one on the blurb inside the front cover, something I have never before seen), at one section in the text, two paragraphs are repeated. Another point is the layout of the photographs. Typically of books produced 20+ years ago, photos are grouped together in sections of glossy pages interspersed through the text. While this approach does not bother me, it requires careful placing of the images to work effectively, and placing a photo with a caption that refers to a major event before it has been covered in the text is very sloppy work. When this happened it was quite a major spoiler for the final section of the book and really disappointed me. I can only assume that there was a great rush to bring this book out after Severin’s journey was completed and it therefore did not get the editorial attention is really deserved. What we are left with is a book that is worth a read for those interested in medieval history or travel writing – or just travelling for that matter. It is written for a general audience and no great knowledge of history, geography or riding is required to get a fairly satisfying few hours of reading out of it. True, the revelations are not staggering (e.g. riding a horse a lot can hurt) but the genial nature of the writing is quietly absorbing – and you may even learn something from it. No Comments on "Crusader: By Horse to Jerusalem"
Collingwood21 is a 32 year old university administrator and ex-pat northerner living down south. Married. Over-educated. Loves books, history, archaeology and writing.